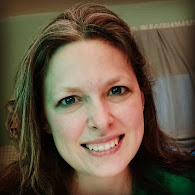 I know I haven't done a WIP for quite a while...but today is the one year anniversary for Lee at Freshly Pieced's weekly Wednesday WIP party - so, I thought today would be a good day to evaluate my WIP's and join the party again. This week I did have a BIG finish...my first quilt! Also, I did a couple of small projects that I showed yesterday...so, now it's almost like starting new! Liz actually said she liked this one better...but she's three...so, I'm going to make the executive decision and add the sashing! Now that we have a pattern, I can start cutting fabric...ooohh! 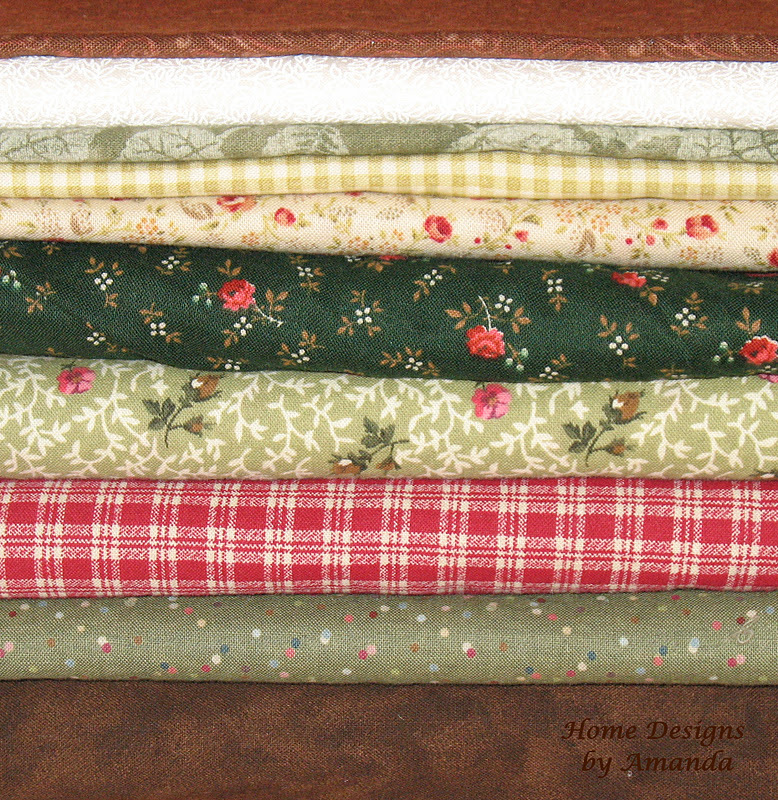 The lower four fabric were picked out and purchased last week during a good sale at JoAnn's. The fabrics in the upper half of the photo are pulled from my stash to coordinate...I'm not sure if all of these will make the final cut or if I'll add some others, but this is our majority of fabrics. I'm still stalled on Liz's Season's quiet book...haven't touched it in months, except to move it! Christmas is coming quickly...I'll have to get it out again soon! There has been little progress on the 60 degree Diamond Fall Table Topper...but I think I did get another star section done since this last photo in August. Wow, that quilt top is absolutely amazing. Love all the bright colours. That is a nice pattern. :) I like the sashing. Have you chosen fabric yet? Congrats on your first finish! It's lovely! Aww...make her the one without sashing mom! lol I'm sure it will look fantastic whichever way you go ;) My mom told me about a cards for soldiers program, I think that's really awesome that you're getting the kids involved making some too. I love that you are making the executive decision. It made me laugh. The postage stamp quilt is great quilt with or without the sashing. Thanks for sharing. i hit up that sale at joanne too last week! how could we resist?! haha good luck with your project! 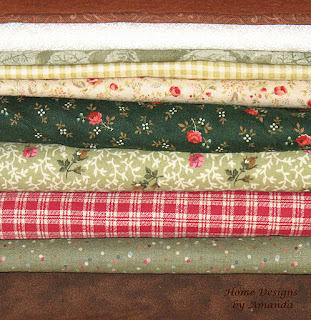 Lovely fabrics for Liz's quilt! That's a cool design and I bet it will look lovely in the fabrics you have pulled out! It is always so nice to have the fabrics pulled and a pattern chosen, I hope you enjoy making your quilt. Love the quilt you've chosen! That's your first quilt?!?!?!? Amazing! I would like to try the diamonds some day...they are always so pretty. The diamonds looks good. I recently finished a quilt like that - only with diamond and hexies to make some space between the stars. Although I really think my hand piecing quota for this year is used my fingers are itching to start a new one soon. I went over to see your first quilt and it is BEAUTIFUL!! So glad you have caught the quilting bug too. It`s a great feeling to finish your first quilt isn`t it? And it`s a beauty! A postage stamp quilt looks like fun. 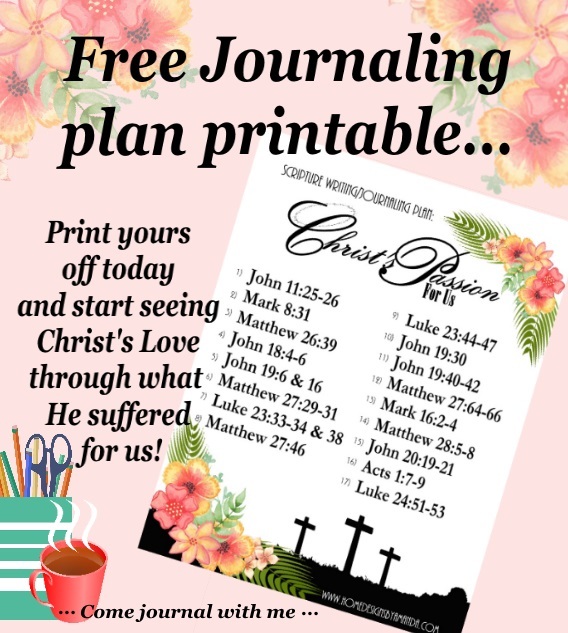 And way to be bold about the Gospel! It'll be a lovely quilt when it's done. And I'm sure Liz will love it - sashing or no sashing! That table topper looks like it's going to be amazing! Everything looks great! Can't wait to see that table topper! I love the idea of adding the sashing to the postage stamp quilt! I also like that each block is random so if there is a color placement issue it's not a big deal; probably could use more scraps that way too.